Let me take a minute to introduce myself. I’m Karyn, the baker and photographer here at Pint Sized Baker. You can send me an e-mail at pintsizedbaker@gmail.com or find me on Facebook, Instagram, and Pinterest. I’m also a Mom, Wife, Daughter, Friend, and animal wrangler. I’m the bus driver, the nurse, the cook, the house cleaner, the laundry gal, the spider/stink-bug catcher, the CEO of our home, the photographer, the composer, the blogger, the baker, and I’d love to learn how to be the candle stick maker. Let’s face it, I’m busy! 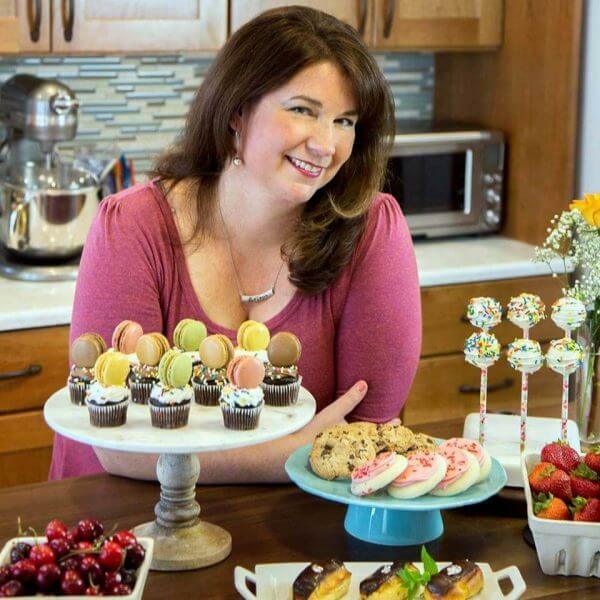 I enjoy making fun, quick, and semi-homemade treats on Pint Sized Baker, but I also like pushing my baking skills and really enjoy the rewards of fresh breads, pastries, and pies. You will find quick and easy recipes like no churn ice cream, skillet cakes, and cookies. I don’t mind cutting a few corners and use cake mixes and brownie mixes and I try to use basic ingredients that you have in your pantry. There is also a selection of over the top, decadent desserts that I made from scratch. You are sure to find a recipe that fits your skill level and will delight your family. You can find My Disclaimer HERE.